May her longevity be stable; and may her aspired aims be spontaneously accomplished. 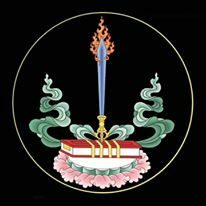 And thus, so it was that on the positive date of the 16th day of the 8th month of the Fire Bird Year in the sixty year Tibetan astrological cycle (rab gnas), this aspiration was made with faithful devotion and pure commitment by Śrī Émaho: Virtue! [Written] on the 6th day of the 10th month of the foreign year 2017 (October 6th, 2017). (Translated from the Tibetan by Erick Tsiknopoulos, in the village of Rakkar, near Dharamsala, India, on October 11-15th, 2017, at the request of Khenchen Lama Pelgyeypa Dorjé Rinpoché).